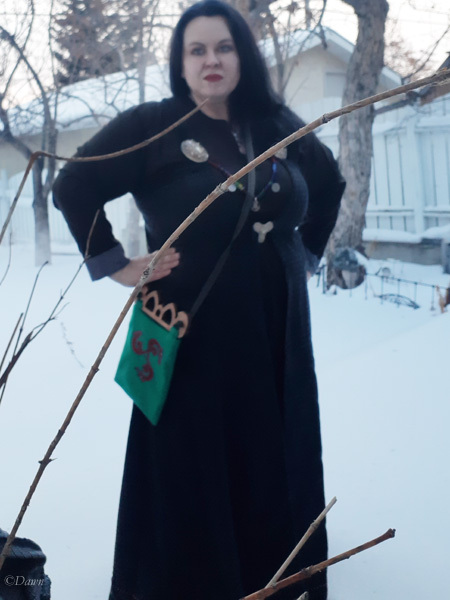 The Maker space that I have been going to for a few months has an embroidery machine, and I decided I wanted to try a few different designs to see if I could use them with Viking-age inspired garb and accessories. The first design I tried was three interwoven boars heads. I designed the image based off one of the designs that I was using for the pyrography boxes, but then pulled it into the PES digitizer, for use on the Brother embroidery machine. I had hoped to do this far larger, but the hoop on the machine is only so big. Another challenge was that I had to do the embroidery over two days – and the hoop must have been bumped or something overnight, since the different colours don’t line up as well as I had hoped they would. The second design is a Viking-style minotaur’s head, since my SCA barony’s heraldry is a minotaur. This was also drawn in Adobe Illustrator, after examples from two different artists I follow online. I used the PES digitizer here too, and this one was much more successful. However I think that the thread colour I used doesn’t work well with the colour of fabric, and the design doesn’t ‘pop’ well from the fabric. Since the lines are quite thin, this is extra difficult. For both embroidery samples, I used a water-soluble stabilizer, though since these won’t get washed (since the wooden handles can’t be washed….) I didn’t worry about removing it all before constructing the bags. I had two different styles of bag handles, in two different sizes, and two different stains. I decided to use some fabric I’d done machine embroidery on to test out these handles, which I felt were better suited to the smaller handles rather than the larger ones. In looking at how other reenactors interpreted the speculative bag style I saw that several had added extra fabrics to the base to make it more decorative, but I didn’t want to do that yet – I wanted to do this really as a test run to see about size and whatnot to see what I want to do for future. Selecting this handle to go with this embroidered fabric. 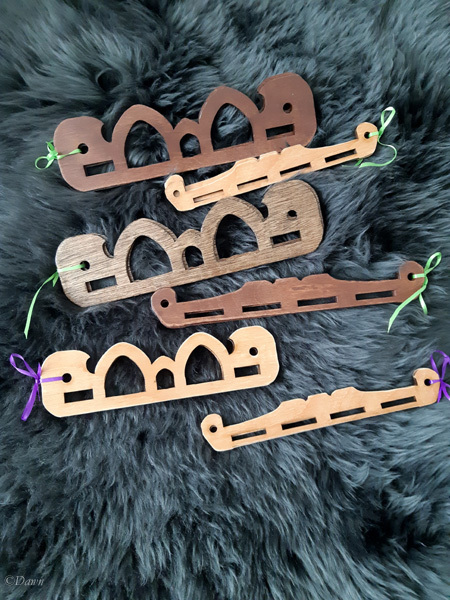 I picked out two of the smaller handles, one in the dark stain and one in the light, and figured out which one I’d use with which embroidery. 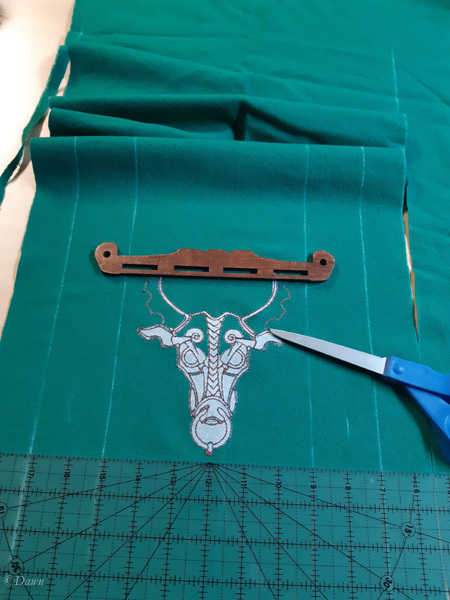 Marking the width of the handle on the reverse of the embroidered fabric for the Hedeby style bag. 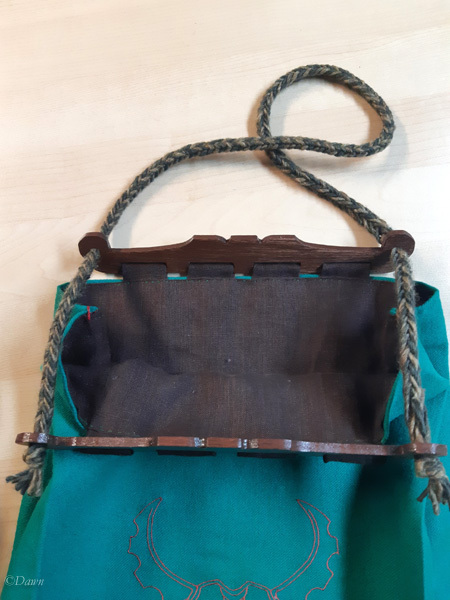 For the bag with the three interconnected boars, I made a very small bag. I only cut the bag slightly larger than the handles. Once I started sewing, I realized this was a mistake, and for the Minotaur head embroidery I cut the fabric considerably wider to correct this. This also meant for the larger bag I could square the bottom, for a roomier bag overall. I also cut a linen bag lining for each bag. I used leftover brown linen fabric from my brown linen Viking influenced underdress. Cutting straps for the Hedeby – style bag, and pinning them to the bag through the handle slots. For the smaller bag, I originally cut four tabs for the handle to attach to the bag itself, but once I started pinning it in place, I realized that with such a small bag, four straps on each side were going to be difficult to work with. For the smaller bag I used the same wool as the embroidered fabric, but for the larger bag I opted to use the brown linen instead. I think ultimately the brown linen works better, and would likely use this for any future versions instead. Hand-sewing the linen lining in place over the handle tabs. The tabs attach the wooden handle to the fabric bag. Since I couldn’t really use a sewing machine to finish the tabs into the bag (and wouldn’t want to either) I hand-stitched (stab-stitch) the tabs into the bag, sandwiching it between the lining and the wool outer fabric. 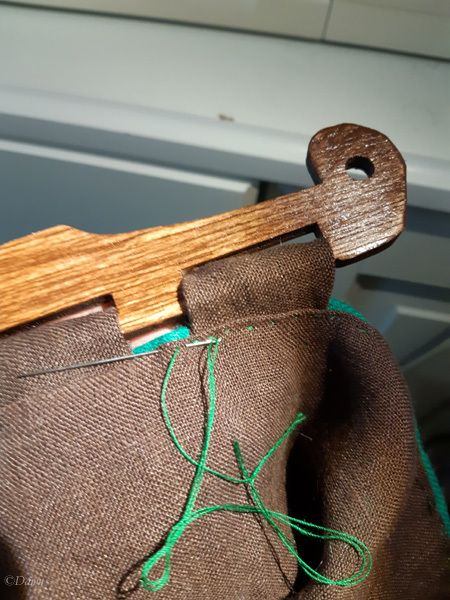 I also did two small thread loops on the inside ‘corners’ where the extra side material folds into the bag on the larger bag – just to keep the sides poking IN, instead of out. My first two Hedeby style bags, ready for their straps. For the small bag, I decided to start with a narrow tube of wool suiting fabric (leftover from an apron dress straps). In time I may opt to make a braided cord strap instead. For the larger bag, I instead opted to do 5-loop (so 10 strands) fingerloop braid for the strap. 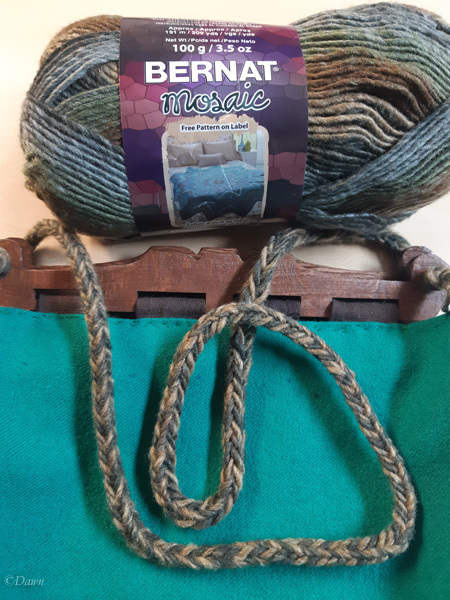 I used Bernat Mosaic in the colourway “Into The Woods”. I could have used handspun yarn, but I really didn’t have anything in the right colour scheme, and thought that this would work well. The ends of the fingerloop slip through both holes in each end of the handle, and are just simply knotted. 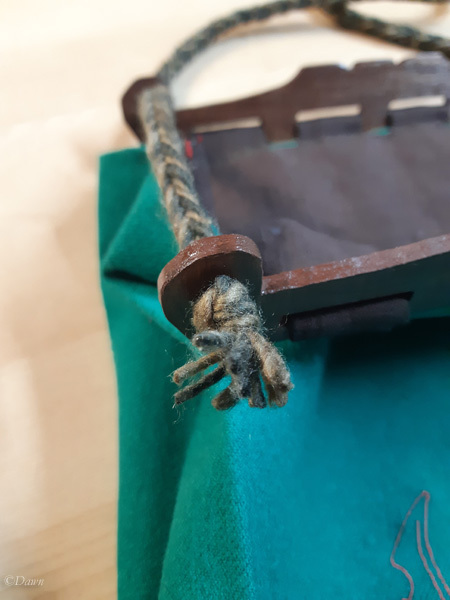 The cord is a bit thick for the holes – for my future versions I’ll either want to do smoother or narrower cord I think – though with how thick it is, it does mean that once opened, the bag stays open a little easier. The smaller bag doesn’t open much at all- the extra material on the sides is very necessary after all. The larger Hedeby-style bag open to access the contents. The Challenge: Upping your game: make something that really stretches you and that works on the bits that you tend to rush through or skimp on. I’m not sure if this represents something I’d usually skimp on.. since this is a first attempt, and usually I am willing to do several attempts before being pleased with a final version. 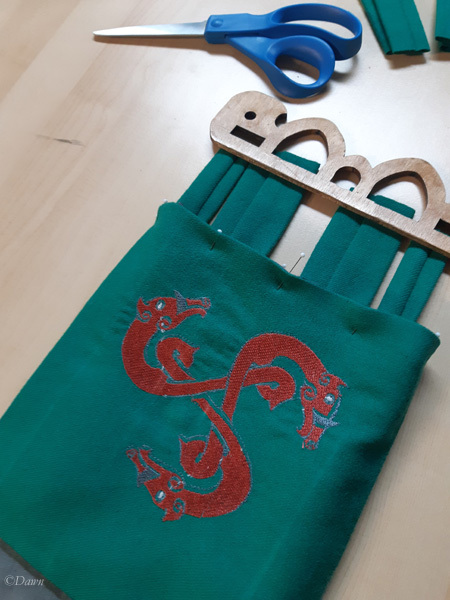 I will say that this is “upping my game” in the sense that I’m using two different techniques (the embroidery machine and laser cutter) to complete this project – though obviously neither are historically accurate! How historically accurate is it? The embroidery designs are entirely made up, but based on ‘look and feel’ of historic artwork. 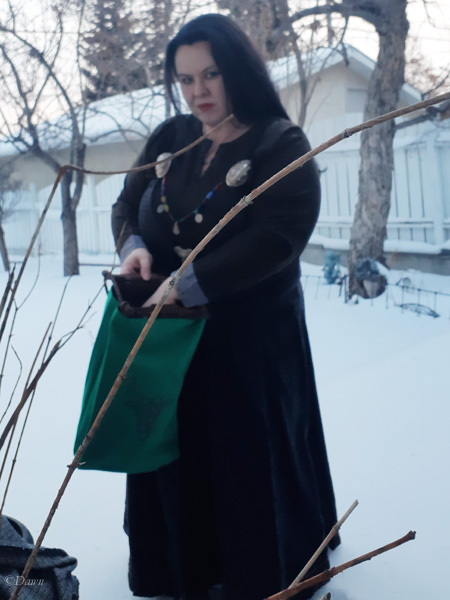 The bag design is entirely speculative based on the extant ‘handles’ found, and their similarity to Sami bags as well as later-period medieval artwork that depicts bags with similar kinds of handles. Total cost: The wood was about $16, but made many, many handles and other things. The wool was from the grandmother’s fabric sale, and was about $1/meter. The embroidery thread was purchased for this project, and I think I spent about $30 in thread.. but there’s loads for future projects too. The linen was leftover from another project, but was about $12/meter. The yarn was leftover from another project, but was around $6/ball. 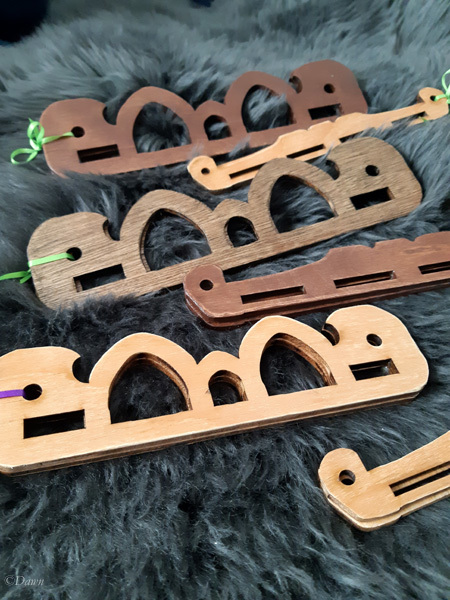 I ended up making more handles than I’ll actually need, so I’m going to be selling a few locally to any other Viking reenactors who would like a set. 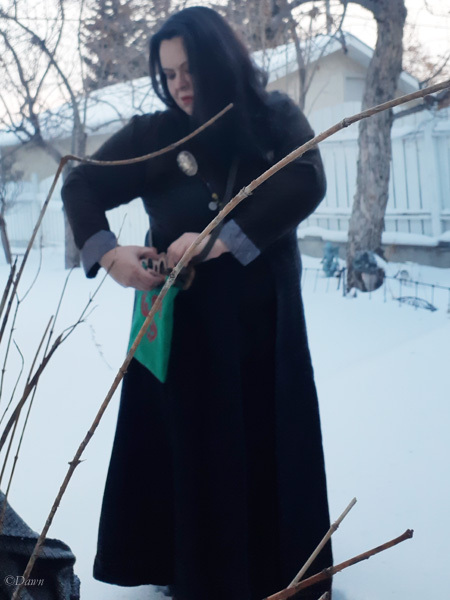 If you’re in the Kingdom of Avacal, check out my Facebook shop to see what is available for sale. 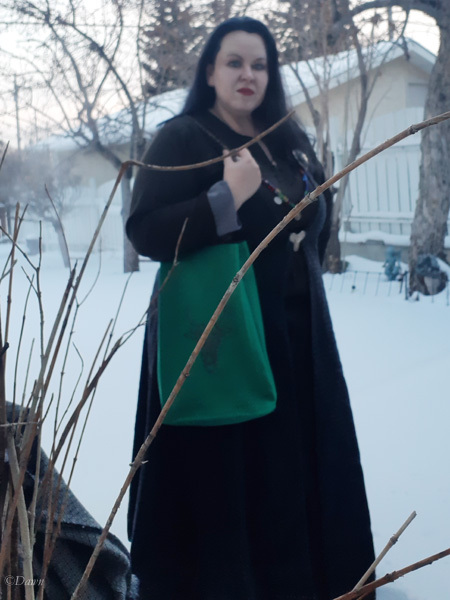 This entry was posted in Garb from a Thousand Lakes, Viking accessories, Viking Textiles/Crafts and tagged bag, embroidery, haibathu, handle, hedeby, Historical Sew Fortnightly, Historical Sew Monthly, HSF, HSM, laser cutter, maker space, wood.